Ask a young boy in Britain what he wants to be when he grows up and there’s a fair chance that professional footballer will be somewhere near the top of his list. 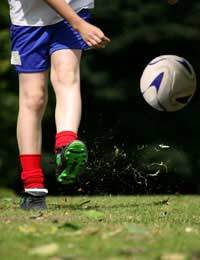 There has never been a shortage of wannabe footballers in the UK and the increasingly lavish lifestyles of the top players can only entice others to dream of fame, fortune and football. But there is an ugly side to the beautiful game, as Davie Young knows only too well. He was just 14 years old when a horrific injury dashed his hopes of becoming a top-class player. By the time Davie had recovered, the professional clubs that had been following his progress were no longer interested. “My dad and one or two of my teachers tried their best to keep my feet on the ground. I was always reminded that very few young players make it into the professional ranks, and told to keep working hard at school so that I’d have academic qualifications to fall back on. To be honest, I didn’t really pay much attention, because all I wanted to do was become a professional football. I was confident I could do it and extremely dedicated and determined.